Any improvement processes should begin with an assessment of the gap between the current state or condition and the desired future state or condition. Having an accurate sense of who you are and what skills and abilities you possess helps you decide what you should do to improve. 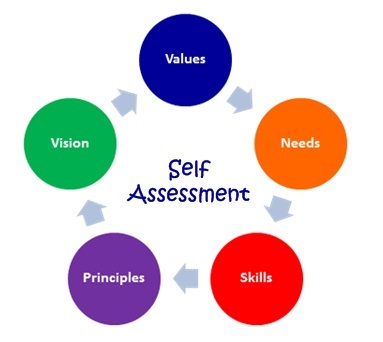 The self assessment process will help reveal a skill’s gap that you may need to work on. It is important to begin the self assessment process by first recognizing that you are separate from your perceived faults and that you are able to change them. Weaknesses and shortcomings do not exist as a person’s permanent qualities, therefore, they can be overcome through consciously addresses them. It is only when we are willing to address them directly that we are able to reach our full potential. It is our awareness of our weaknesses and our willingness to address them that helps facilitate the process of personal development. While people’s values, beliefs, and principles remain fairly constant throughout his or her life, people’s abilities and competencies are constantly changing, growing, and developing. Therefore, it is necessary for everyone to re-assess themselves periodically in relation to their goals.